Discount available! 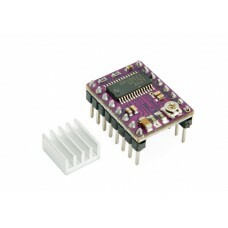 Recommend DRV8825 Stepper Motor Driver Carrier, 2,2A to your friends and get your Discount. The DRV8825 stepper motor driver carrier is a breakout board for TI’s DRV8825 micro stepping bipolar stepper motor driver. The module has a pinout and interface that are nearly identical to those of the A4988 stepper motor driver carriers, so it can be used as a higher-performance drop-in replacement for those boards in many applications. The DRV8825 features adjustable current limiting, overcurrent and overtemperature protection, and six micro step resolutions (down to 1/32-step). It operates from 8.2 – 45 V and can deliver up to approximately 1.5 A per phase without a heat sink or forced air flow (rated for up to 2.2 A per coil with sufficient additional cooling). Four, six, and eight-wire stepper motors can be driven by the DRV8825 if they are properly connected. Stepper motors typically have a step size specification (e.g. 1.8° or 200 steps per revolution), which applies to full steps. A micro-stepping driver such as the DRV8825 allows higher resolutions by allowing intermediate step locations, which are achieved by energizing the coils with intermediate current levels. For instance, driving a motor in quarter-step mode will give the 200-step-per-revolution motor 800 micro steps per revolution by using four different current levels. The resolution (step size) selector inputs (MODE0, MODE1, and MODE2) enable selection from the six step resolutions according to the table below. All three selector inputs have internal 100kΩ pull-down resistors, so leaving these three micro step selection pins disconnected results in full-step mode. For the micro step modes to function correctly, the current limit must be set low enough (see below) so that current limiting gets engaged. Otherwise, the intermediate current levels will not be correctly maintained, and the motor will skip a micro step. Each pulse to the STEP input corresponds to one micro step of the stepper motor in the direction selected by the DIR pin. These inputs are both pulled low by default through internal 100kΩ pull-down resistors. If you just want rotation in a single direction, you can leave DIR disconnected. The DRV8825 also features a FAULT output that drives low whenever the H-bridge FETs are disabled as the result of over-current protection or thermal shutdown. The carrier board connects this pin to the SLEEP pin through a 10k resistor that acts as a FAULT pull-up whenever SLEEP is externally held high, so no external pull-up is necessary on the FAULT pin. Note that the carrier includes a 1.5k protection resistor in series with the FAULT pin that makes it is safe to connect this pin directly to a logic voltage supply, as might happen if you use this board in a system designed for the pin-compatible A4988 carrier. In such a system, the 10k resistor between SLEEP and FAULT would then act as a pull-up for SLEEP, making the DRV8825 carrier more of a direct replacement for the A4988 in such systems (the A4988 has an internal pull-up on its SLEEP pin). To keep faults from pulling down the SLEEP pin, any external pull-up resistor you add to the SLEEP pin input should not exceed 4.7k. The DRV8825 supports such active current limiting, and the trimmer potentiometer on the board can be used to set the current limit. You will typically want to set the driver’s current limit to be at or below the current rating of your stepper motor. One way to set the current limit is to put the driver into the full-step mode and to measure the current running through a single motor coil without clocking the STEP input. The measured current will be 0.7 times the current limit (since both coils are always on and limited to approximately 70% of the current limit setting in full-step mode). So, for example, if you have a stepper motor rated for 1 A, you can set the current limit to 1 A by setting the reference voltage to 0.5 V.
Please note that measuring the current draw at the power supply will generally not provide an accurate measure of the coil current. Since the input voltage to the driver can be significantly higher than the coil voltage, the measured current on the power supply can be quite a bit lower than the coil current (the driver and coil basically act like a switching step-down power supply). Also, if the supply voltage is very high compared to what the motor needs to achieve the set current, the duty cycle will be very low, which also leads to significant differences between average and RMS currents. Additionally, please note that the coil current is a function of the set current limit, but it does not necessarily equal the current limit setting. The actual current through each coil changes with each micro step. See the DRV8825 datasheet for more information. The pin used to supply logic voltage to the A4988 is used as the DRV8825’s FAULT output since the DRV8825 does not require a logic supply (and the A4988 does not have a fault output). Note that it is safe to connect the FAULT pin directly to a logic supply (there is a 1.5k resistor between the IC output and the pin to protect it), so the DRV8825 module can be used in systems designed for the A4988 that route logic power to this pin. The SLEEP pin on the DRV8825 is not pulled up by default like it is on the A4988, but the carrier board does connect it to the FAULT pin through a 10k resistor. Therefore, systems intended for the A4988 that route logic power to the FAULT pin will effectively have a 10k pull-up on the SLEEP pin. The DRV8825 offers 1/32-step micro stepping; the A4988 only goes down to 1/16-step. The mode selection pin inputs corresponding to 1/16-step on the A4988 result in 1/32-step micro stepping on the DRV8825. For all other micro stepping resolutions, the step selection table is the same for both the DRV8825 and the A4988. The DRV8825 can deliver more current than the A4988 without any additional cooling.